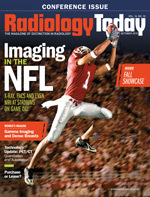 Radiology is joining Twitter. More precisely, a growing number of academic radiology departments are using Twitter to spread the word about what they're doing, says Vinay Prabhu, MD, MS, a radiology resident at New York University (NYU) Langone Medical Center in New York. Prabhu and Andrew B. Rosenkrantz, MD, MPA, another radiologist there, authored a study published in the July issue of the Journal of the American College of Radiology that found that 10 of 183 academic radiology departments surveyed in 2014 (5.5%) had active Twitter accounts, defined as posting at least one tweet within a three-month period. Since then, Prabhu says, the number has more than doubled. "Medicine is really adopting Twitter, as a whole, and they're finding different ways to use it," Prabhu says. "At first, it was mainly individuals adopting Twitter, but it's become more organizational. I definitely think that more people are going to start adopting it, as we go on." The active accounts averaged 61 tweets, 612 in total, and 711 followers during the three-month study period. The University of California, San Francisco (2,885), Massachusetts General Hospital (1,602), and Cincinnati Children's Hospital (1,183) had the most followers. Most of the tweets were used to promote department-sponsored lectures, congratulate department members on achievements, or publicize departmental research. Other common tweets included external links to picture or video sharing sites, the organization's blogs and websites, peer-reviewed or lay press articles, medical society websites, and Facebook. Prabhu says positively endorsing a department's accomplishments and achievements is one valuable way that Twitter can be used, but he adds that there are other potential Twitter uses that can benefit radiology practice. Many tweets were used to disseminate radiology-related educational content. Because of Twitter's 140-character per tweet limit, some departments included pictures and/or shortened links to clinical cases in their tweets. Prabhu says this is an extremely effective use of Twitter because it helps develop clinical expertise and educate the next generation of residents. "One or two departments, in particular, were linking quite a bit to pages they had set up or different clinical cases that they had created using specific images," Prabhu says. "Radiology is image-based and image-rich, and we use our eyes a lot more, sometimes, than we use our words; we try to be concise." Some departments sent tweets to patients about medical guidelines, such as advice about when to have a mammography screening. Prabhu says clear, concise Twitter messages and links to research studies about the appropriate age for screening and how often to get screened can help patients make informed decisions. He says this type of use can also help disseminate evidence-based medicine, such as research studies from other institutions. Prabhu believes Twitter may prove especially useful in advocating for policy changes. He sees a strong potential to build coalitions around radiology-centric policies by reaching out to Twitter's 316 million monthly active users. "It's one thing to suggest to patients that they get their mammograms, but radiology departments may be able to organize coalitions and/or groups of radiology departments to get the word out about certain screening guidelines or other guidelines that they would suggest," Prabhu says. "I'm not advocating for one policy over another, such as when to start screening, but there's probably enough power out there on Twitter, with the followers that these departments have, to bring groups of people together to support causes." Using Twitter effectively requires more than just setting up an account. Prabhu says it takes time and effort to do it well, and it can be a challenge to get an entire department on board with the process. He recommends that departments designate a point person to maintain the purpose of the account and keep it fresh by regularly posting items that will interest followers. It's also important to make sure that no inappropriate content, such as protected health information or profanity, is posted. Because of the added work and potential pitfalls, some departments may choose not to have a Twitter account, but there's no question that its use among medical practitioners is growing. When he first started studying social media in 2012, Prabhu says he found fewer than 50 mentions of Twitter on PubMed.gov. He says that currently there are at least 10 times as many, although that total includes references outside of radiology, too. He expects that radiology departments will continue to find new ways to use it. "The more that departments get on Twitter, they might start exploiting it in different ways, as opposed to just promoting themselves and using it as another way of advertising," Prabhu says. "I think they'll probably discover different ways to use it that are already being used in a small subset of departments but have not become widespread, yet." — David Yeager is freelance writer based in Royersford, Pennsylvania. He writes primarily about informatics topics for Radiology Today.